What does A$AP Rocky really want? Sometimes I think it’s just for everyone to know he’s well-rounded. He raps, produces, models, designs, directs, acts, fronts a rap crew, and steers whatever AWGE is. People don’t expect boys from Harlem to have that range. You can see it in certain folks’ pleasant surprise to see kids grow up with different plans than city work or career college, in their tendency to size up muscular boys and telegraph what kind of sporting career they’re angling at, and in the nagging habit of genteel older white folks to adopt a light, outdated AAVE and say things like “my man” to you because they learned some jive in the ’70s. Everyone means well, but what they’re really doing is socializing us into a sense of creative scope that’s smaller than our actual sphere of possibilities. If you’re a dreamer, that puts a chip on your shoulder, and you live to show the world what you’re capable of. There are moments when the new A$AP Rocky album, Testing,gestures at this desire to be understood and appreciated, to look back at the young entrepreneur’s road to riches in amused disbelief at how a young man makes it out of homeless shelters and onto magazine covers and movie screens. “Tony Tone” opens up saluting Rocky’s parents and wondering why other people go to the trouble of siring children they appear to have no intention of raising. Elsewhere, “OG Beeper,” offers a rags-to-riches story where a young Rocky craves cash and notoriety, then present-day Rocky relishes the fact that he finally found it. It’s told in a cadence that resembles a nursery rhyme, but unlike, say, Slick Rick’s “Children’s Story,” which uses its cautionary kiddie-tale conceit to lay out stakes and consequences for its ill-fated stickup kid protagonist, “Beeper” is relieved to get through the bad parts so it can lounge around in the fact the guy’s rich now. Testing gets off to a rowdy, promising start, but as the album unfolds, Rocky’s interest in the act of rapping dwindles, as he gets to work cultivating an intriguing sensory experience. It’s playing a different game than your average 2018 hip-hop album most of the time, one you notice 30 seconds into the album opener “Distorted Records,” when a flatulent bass line cleaves the silence, and the rapper picks up rhyming over a beat whose textures and intricacies slowly divide and expand like bacteria. Testing is a drug album, but to paraphrase Chance the Rapper, they’re not doing the same drugs anymore. LSD is clearly the guiding light, where the inspirations for the great early A$AP records were southern rap, promethazine syrup, and the dearly departed A$AP Yams’s exquisite taste. Rocky’s been talking about acid since 2015, when he lead his sophomore album At Long Last A$AP with the psych-rap nugget “L$D,” but Testing is the first A$AP record that actually sounds designed by, and for, people who are tripping. Often, Testing’s vocals feel like enticing fabric swatches rather than centralized narrative lines. (That makes sense. People on hallucinogens fixate on colors and patterns to a point where they can describe the sights of a trip in lurid detail for days afterward.) The best songs, like the Smooky Margielaa and Playboi Carti tag team “Buck Shots,” warp the sound of the human voice, sometimes at the cost of trailing off in the middle of what sound like good verses. 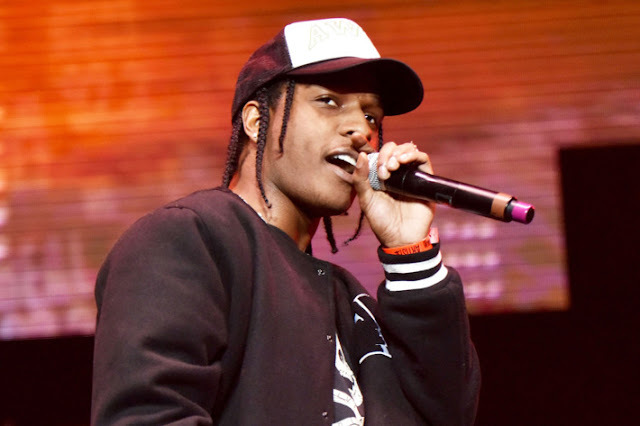 “Back in my younger days all I want was braids,” Rocky raps in the third verse, after spending the first two just pinballing cocky insult lines. “All my mama want from me was grades.” Instead of resolving the story, he disappears again. “My biggest distraction is that I get distracted,” he says in “Changes.” Rocky’s raps always attempted a risky balance of style and substance, but these songs dip in and out of profundity like someone testing steaming bathwater for temperature but never taking the plunge. This quality might make Testing the first post–Playboi Carti, A-list major-label rap album. The best moments of Carti’s AWGE debut, Die Lit, sounded like the Ewok scenes in Return of the Jedi; human voices comingled with humanoid noises to commute both an expression of and an alien distortion of the English language. On Testing, voices pop in and out of frame, samples get chopped and screwed, record scratches cut into the present with shards of the recent past, and uncredited collaborators slide in and out unannounced. While the approach to vocals mirrors Carti’s work, the way samples are used mirrors that of excommunicated A$AP Mob affiliate Spaceghostpurrp, whose Blackland Radio 66.6 and Purrped and Chopped tapes drafted the same kind of overcooked Three 6 Mafia–obsessed splatter-paintings-on-a-bedroom-wall level in 2011. All these records make for appropriate summer music, not because they elicit the ease of speeding down a highway on a sunny afternoon but because they sound like what suffering on a hot day feels like, the sensation of everything inside and outside of you slowly melting. What Testing has that some of its antecedents might not, is clout. Flacko wants you to know this thing cost money and deep connections to make. There’s Outkast and Lauryn Hill interpolations; instrumental tracks from Blood Orange’s Dev Hynes and MGMT’s Andrew VanWyngarden; and vocals from Frank Ocean and FKA Twigs. It takes a special kind of magnetism, Testing seems to want you to know, to gather all of these parties for the same project. Rocky often makes fascinating use of his guests. In “Gunz N Butter,” he raps over a screwed-up slice of the Project Pat song “Still Ridin’ Clean” until Juicy J, Pat’s brother and the original song’s producer, pops out disorientingly mimicking the same flow. On “Praise the Lord (Da Shine),” Skepta crushes a verse that shouts out DMX, and “Tony Tone” restores some old New York feeling with Diddy ad-libs and a funny mini-skit where Rocky gets cussed out by a listener for language.